Maarten Ten Holter at Vripack Yacht & Ship Brokers asks me to spread the word that he'll be exhibiting his central listing, the 36.58m motor yacht Private Lives at next month's Cannes Boat Show. Built by Turkey's RMK Marine in 2003 to a Vripack design, she's a world cruising expedition superyacht with a range of 5,000 nautical miles at 11 knots. Stable and strongly built to Lloyds class and MCA compliant, Private Lives has very spacious and luxurious interior volumes for 10 guests in a master, two double and two twin cabins. 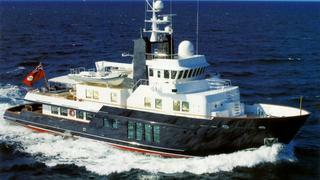 Her asking price is €7.95 million.